There are no simple answers when it comes to selecting a firearm and accompanying ammunition. How accurately you shoot is far more important than the type of rifle, cartridge, and bullet you choose. Alaska has some very large game animals, including 1600-pound mature bull moose and 1500-pound coastal brown bears. Moose or brown bear hit in the gut with a large caliber magnum rifle such as the popular .338 Winchester® Magnum is wounded and just as likely to escape as if it had been hit with a small caliber rifle such as the .243 Winchester®. The bore size, bullet weight, and velocity are of secondary importance to precise bullet placement in the vital heart-lung area. It is important for the hunter to have a good knowledge of game anatomy, the ability to correctly judge distance, the discipline to take only shots that can be made with certainty, and the ability to shoot accurately from sitting, kneeling, and standing positions. You should be able to reliably place a bullet in a circle the size of the game's heart/lung zone from hunting positions at the distances you expect to be shooting. As long as the caliber is reasonable and a quality bullet is used, hunters kill game quickly and humanely with precise bullet placement. If you presently own a rifle chambered for the .270 Winchester, 7mm-08, .308 Winchester or .30-06 and can place all of your shots in an 8-inch circle out to 200 yards from a sitting or kneeling position you can be a successful Alaska hunter. To be as effective as possible, these cartridges should be loaded with premium quality bullets that are designed to pass completely through a large game animal, if hit in the heart-lung area. The rifle you bring hunting should be one with which you are comfortable. Because of the presence of brown and grizzly bears, many hunters have been convinced that a .300, .338, .375, or .416 magnum is needed for personal protection and to take large Alaska game. This is simply not true. The recoil and noise of these large cartridges is unpleasant at best and plainly painful to many shooters. It is very difficult to concentrate on shot placement when your brain and body remembers the unpleasant recoil and noise which occurs when you pull the trigger on one of the big magnums. The two most common complaints of professional Alaska guides are hunters who are not in good physical condition and hunters who cannot accurately shoot their rifles. Because these hunters do not practice enough they cannot shoot accurately enough. They miss their best chance at taking their dream animal or worse yet, they wound and lose an animal. Most experienced guides prefer that a hunter come to camp with a .270 or .30-06 rifle they can shoot well rather than a shiny new magnum that has been fired just enough to get sighted-in. If you are going to hunt brown bear on the Alaska Peninsula or Kodiak Island, a .30-06 loaded with 200- or 220-grain Nosler® or similar premium bullet will do the job with good shot placement. Only consider using a .300, .338 or larger magnum if you can shoot it as well as you can the .30-06. It is very popular now to purchase large magnum rifles equipped with a muzzle brake. Most muzzle brakes are very effective at reducing recoil. A .375 magnum with a muzzle brake recoils much like a .30-06. Before convincing yourself that you should use a muzzle-braked rifle, consider its disadvantages. A muzzle-brake increases the muzzle blast and noise to levels that quickly damage the ear. Even when just sighting in or practicing, everyone near you at the range will find the blast and noise bothersome. Anyone near the muzzle brake when the rifle is fired may suffer hearing loss or physical damage to the ear. An increasing number of guides will not allow a hunter to use a muzzle brake because of the danger of hearing loss. Rather than rely on a muzzle-brake to reduce recoil, use a rifle heavy enough to reduce recoil. If you are planning on packing out moose meat, caribou meat, or a brown bear hide weighing hundreds of pounds, you can carry a 9- to 11-pound rifle including scope. A rifle of this weight in .300 or .338 magnum can be mastered with a lot of practice. You can also avoid using a muzzle-brake by selecting a cartridge that you can shoot comfortably and enjoy shooting enough to practice with frequently. For most hunters, the upper limit of recoil is the .30-06 or 7mm Remington Magnum®. A majority of hunters are more comfortable with a .308 or .270. If you are choosing a rifle for hunting in Alaska, you should strongly consider a modern bolt action rifle made of stainless steel bedded in a synthetic stock. A bolt action is recommended because it is mechanically simple, can be partially disassembled in the field for cleaning, and is the most reliable action under poor weather conditions. Stainless steel is excellent for most Alaska hunting because it resists rust caused by rain or snow. However, stainless steel will rust with time so must be maintained after each day of field use. Alaska big game varies from the relatively small (deer, goats) to the largest game on the continent (brown bears, moose). In general, hunters should select a larger caliber for the largest game. Cover type should also play a role in cartridge selection. Sheep and goats are almost always hunted in the mountains where long distance visibility is the rule. A smaller, flat-shooting cartridge may be best here. Deer in the coastal forests of Southeast Alaska are often shot at less than 20 yards. Moose in the Interior may be shot at intermediate distances. Select your cartridge based on the expected circumstances. A high quality rifle bullet placed into the heart or lungs of a big game animal at approximately 2000 to 2800 feet per second will expand or "mushroom" and destroy the vital organs. The shape of the bullet has no direct effect on its function, its accuracy, or its ability to kill. A "round-nosed" bullet that penetrates and destroys a vital organ is just as effective as the most streamlined of bullets. However, a pointed bullet does not lose velocity as quickly as a round-nosed bullet. For example, a .30-06 firing a 180-grain pointed bullet which leaves the barrel at 2700 feet per second, is travelling 2300 feet per second at 200 yards. In comparison, a round-nosed 180 grain bullet at the same speed will have slowed to 2000 feet per second at the same distance, because the pointed bullet can cut through the air with less resistance just like a sleek fighter jet. Under actual field conditions, this will make no difference between a good hit, bad hit, or miss. At distances beyond 200 yards, a pointed bullet will not drop as quickly as a round-nosed bullet. Most hunters should not shoot big game at distances further than 200 yards. The bullet shape is not as important as the quality of the bullet and how well your rifle will shoot a particular bullet. Some rifles will shoot a pointed bullet more accurately and some will shoot a round-nosed bullet more accurately. You should try quality bullets of both shapes to find out which weight and shape produces greatest accuracy in your firearm. A bullet must be "tough" enough to penetrate through skin, muscle, and even bone to reach the vital organs. It must also be "soft" enough to expand and disrupt the function of these vital organs. Throughout the history of bullet making, this has been the constant challenge—find the proper balance between "soft" and "tough." Modern bullets are typically constructed from a copper or copper alloy "jacket" that surrounds a lead or lead alloy core, except at the very tip or "nose" of the bullet. Most conventional bullets have jackets that are thin near the nose and taper to a thicker diameter near the base. This method of construction is designed to control the rate of expansion, as the bullet will open or "mushroom" quickly toward the thin "nose" but will not "mushroom" as quickly near the base. 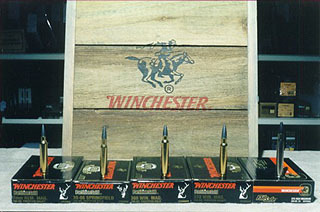 Examples of this type of bullet are the Hornaday Interlock®, Speer Grand-Slam®, and Remington Core-Lokt®. The advantage of these bullets is that they are relatively inexpensive and work well on most game animals at ranges from 50 to 200 yards. At typical velocities, these are excellent bullets for almost any game. One can say with high confidence that a big game animal hit in the heart-lung vital zone with one of these bullets will die swiftly and certainly. The next step in bullet construction and bullet complexity is the "partitioned" bullet. These include the Nosler Partition®, the Swift A-Frame®, and the Trophy Bonded Bear Claw®. These bullets share a common feature; all of them have a tapered jacket that is "H" shaped (see picture). The cross-bar of the "H" is a part of the jacket itself. Each end of the "H" is filled with lead, a lead alloy, or tungsten alloy. These bullets are designed to expand quickly at the front but never expand below the cross-bar of the "H." In theory, this should be the best of both worlds: Excellent expansion to destroy tissue and a protected core that will ensure deep penetration. The performance of partitioned bullets is excellent—they perform about as well in real life as in theory. If a moose, elk, caribou, or even brown bear is hit in the heart-lung vital area, these ultra-tough bullets often exit on the opposite side, leaving a better blood trail and ensuring a double-lung hit. The only negative of these premium bullets is cost. For example, a box of factory loads with Nosler®, Swift®, or Trophy Bonded® bullets typically costs at least twice as much as a box of conventional bullets. To sum up on the subjects of firearm, cartridge, and ammunition selection: You can’t go wrong with a stainless steel bolt-action rifle chambered for a standard cartridge that you are comfortable with and can shoot accurately, loaded with a high quality bullet.